At present time, many of the Templates used for upload are not yet updated with NENT Group naming. This article refers to the existing MTG templates until these Templates are updated. This document provides a step by step guidance when delivering media files to Nordic Entertainment Group. If you get tired of selecting this option you can "Save choice now and skip later". Mediabank will then remember your preferences and skip straight to next screen as shown below. You can deliver both commercials and broadcast content to Nordic Entertainment Group. Both destinations are supported by intuitive templates to ensure the metadata quality. Select Commercials or Broadcast content, and click on respective "Add files" button. You can select one or multiple assets in one operation for delivery. Both Broadcast and Commercial content are described below in separate sections. 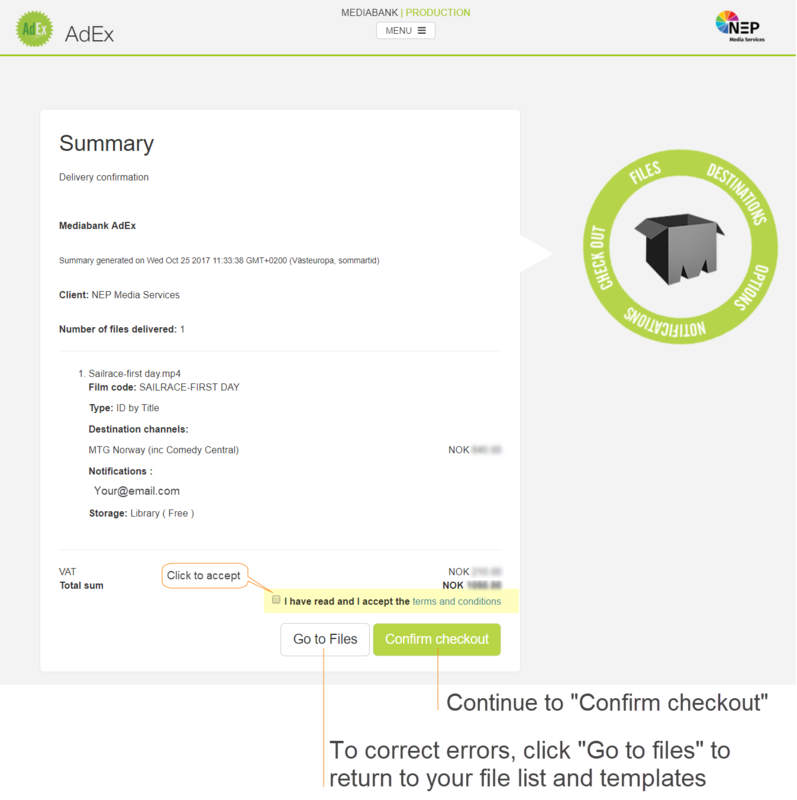 After you have selected the Aspera or Standard upload you will find yourselves located in the above image. And since you have selected this document you already know that Deliver Broadcast content is the way to go. Click on the green area to the right with the text Add files. The green wheel to the right is not documented since the input and selections are handled by the Nordic Entertainment Group templates when delivering the broadcast content. File: That is the name of your media file ready for upload, normally with MOV or MFX extensions. Destination: Again, select the Nordic Entertainment Group destination that suits your purpose. 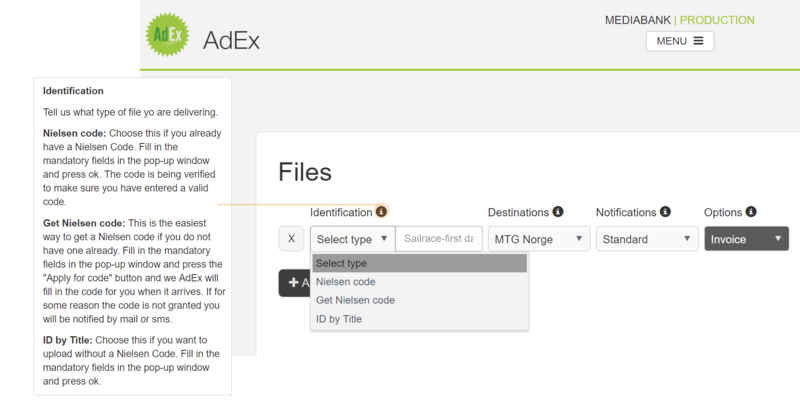 Type: Selecting NENT Group Norway (In this example) provides these options in the drop down menu. At this point you can click on +Add more files to load them into the Upload queue or just continue to fill in the TAG scheme for the present media file. You must however repeat the procedure separately for each media file including filling out the Tag scheme for each media file. At some point you may have selected the wrong media file for upload and you wish to remove it. Just click on the X all the way to the left of the file name and it will be removed from the upload queue. The original media file is not deleted. You will probably see one of the below templates in expanded view dependent of the "Type" you selected. This article focus on "Program Master". Check the heading In the upper left corner in the TAG template to secure you have the correct media file "Type". As you can see below there are different schemes for each medial file type. A clean version of each promo produced for air on NENT Group should be delivered and uploaded by the production companies to Mediabank for the use by NENT Group. As a first step, house numbers for each clean promo have to be requested from NENT Group’s scheduling department. The request should ideally come from the marketing teams dealing with the production companies. The marketing teams have to email the scheduling department in London to request house numbers for each clean promo that will be uploaded, including promo names and durations. Once you have the house numbers, you can use them to upload the clean material to Mediabank. The production companies should under no circumstances be re-uploading cleans under the same house numbers! If they do make a mistake or would like to deliver an updated version of a promo, they will have to send us an email, cancel the incorrect clean along with its house number and request a new house number for the corrected version. If the information contain errors you should contact your local administrator before proceeding further. If you feel a need to check the technical specifications you can find the documentation in the article: Nordic Entertainment Group - file deliver specs, or click on the Technical specifications in the template scheme. Unless you are instructed to choose one, there is actually no need to select a list since the template contains the relevant recipients by default. Normally you end your media parts with the last frame 24 (FF). If the media asset is eligible for Vod streaming service, you must answer Yes. This is the place to write down any technicality issue, information about the delivery or Media issues. It could also be information about the media that contain deliberately distorted quality/colors or similar. After your selection of asset(s), you must fill in the Identification. Applying for a Nielsen code. You will be prompted with a new popup box where you fill out necessary information needed to create a valid Nielsen code. It will automatically be embedded into your delivery after your final submission. It's plain magic! To the right of the "Select type" dropdown menu, the mediafile "Sailrace-first day" is ready for upload. You may also deliver your commercials without the use of Nielsen code. Select "Id by Title". 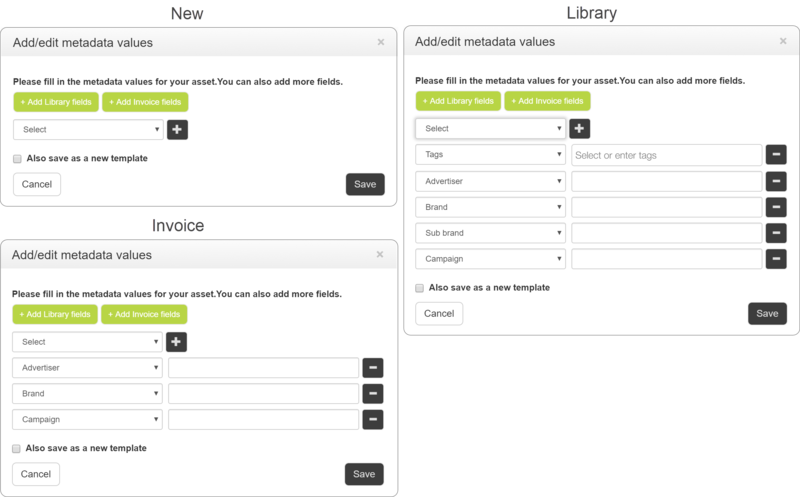 A template will pop up and help you to add the proper metadata. In case of multiple Advertisers or Brands, separate them with the use of comma. Below, you can see the different templates. Your destination is MTG Oslo Broadcast center (Only available destination in your Template). Unless you are notified to use notification lists, you can leave it and continue using "standard" In any other circumstances, click in the notification box and select from the predefined notification lists. 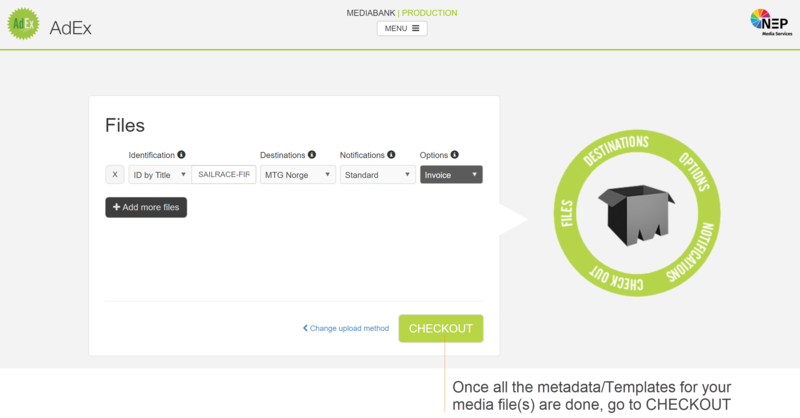 To ensure correct destination for your media files, Mediabank provides metadata templates for the uploader to fill in. To secure the quality, several predefined Tags are available and can easily be selected from the drop-down menus. After pressing CHECKOUT, you will be transferred to the final step (image below) before the media file(s) are uploaded. Read trough and verify the Delivery confirmation. Then click to accept the "terms & conditions" and proceed to "Confirm checkout". Your upload have started. If you find mistakes like missing/wrong media file or any other irregularities, you can press "Go to files" to make your corrections and then go to CHECKOUT again.